Shelley Kempner of Queens, who was shopping at Fairway on the Upper West Side on Sunday, said she liked "the idea of not putting more plastic into the environment." They dangle from the arms of many New Yorkers, a nearly ubiquitous emblem of empathy with the environment: synthetic, reusable grocery bags, another must-have accessory for the socially conscious. But the bags, hot items at upscale markets, may be on the verge of a glacier-size public relations problem: similar bags outside the city have been found to contain lead. “They say plastic bags are bad; now they say these are bad. What’s worse?” asked Jen Bluestein, who was walking out of Trader Joe’s on the Upper West Side with a reusable bag under her arm on Sunday. There is no evidence that these bags pose an immediate threat to the public, and none of the bags sold by New York City’s best-known grocery stores have been implicated. But reports from around the country have trickled in recently about reusable bags, mostly made in China, that contained potentially unsafe levels of lead. The offending bags were identified at several stores, including some CVS pharmacies; the Rochester-based Wegman’s grocery chain recalled thousands of its bags, made of recycled plastic, in September. 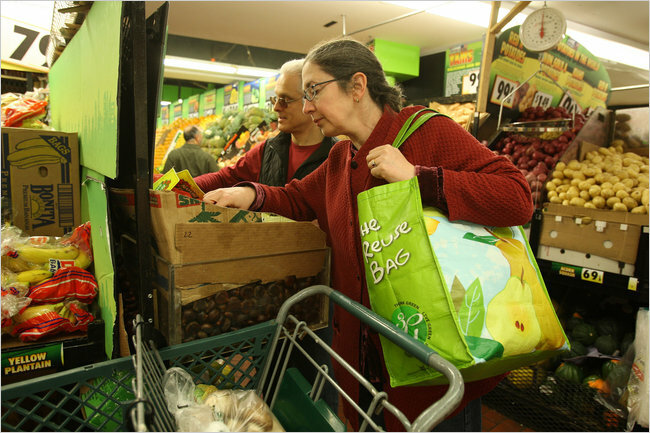 Reusable bags have maintained their popularity even amid charges that they become hothouses for bacteria. The recent studies, none of which were conducted by the government, found that the lead in some bags would pose a long-term risk of seeping into groundwater after disposal; over time, however, paint from the bag could flake off and come into contact with food. Climate-change-conscious shoppers at one of Manhattan’s culinary meccas on Sunday said they were chagrined that yet another good intention had gone awry. Told of the recent lead findings, Ms. Kempner sighed — “It’s still not good enough” — and wondered if she would have to switch to something else. “Are we going to have to start using string?” she asked. “There’s always something wrong with everything,” said Barry Lebost, standing outside the Trader Joe’s on West 72nd Street with four reusable bags filled with groceries. But many shoppers said they would continue relying on the bags until more information came out. The bags are usable for years, they said, and any long-term effects of lead may be offset by the environmental benefits gained by not using regular plastic bags. Mr. Schumer’s family also shops at Fairway. A spokesman for the senator said the family planned to bring the issue to the attention of the store to see if the bags there were affected.